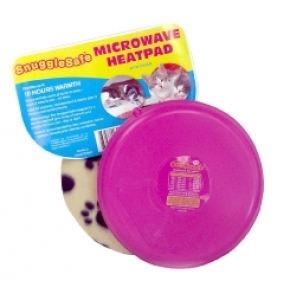 Snuggle Safe Microwave Heat Pad. Snuggle safe Heat Pad contains Thermapol that is non toxic and can sustain warmth that can last up to 10 hours, once placed in the cosy cover provided or under a blanket. In a 800 watt Microwave the heat pad would require only 6 minutes heating. Gives a constant heat 45 - 56 degrees over 5 - 6 hours and then slowly declines for remaining 4 hours. Size 8" -210mm diameter. weight 0.9kg. Ideal for new born Puppies, Kittens as well as animals kept outside such as Rabbits, Guinea Pigs and Kennelled Pets. Bite Resistant. DO NOT reheat from warm or overheat. Wait until cold before re-heating.